KHOTANG, July 30: Construction work on a motorable bridge over Sapsu River along the Sagarmatha Highway has come to a halt. The bridge, which connects Rajapani and Batase in the Diktel-Gaighat section of Sagarmatha Highway, has been under construction for the past three years. Construction work started in 2014 with a target of building the bridge within 18 months with an investment of Rs 60 million. Locals told Republica that the second deadline to complete the project expired three months ago. They say that the contractor company, Devsayar and Kanchharam JV, has not taken the work seriously. Bridge construction work has come to a grinding halt for the past few days. Because of the delay in bridge construction, locals are forced to take a risky journey via Phoksingtar and Diktel to reach Gaighat. Contracting firm, Devsayar and Kanchharam JV, had signed project contract about three years ago. The firm had created framework for concrete paving of the bridge. But all works have come to a halt after floods, three months ago, swept away 12 of the 24 support pillar erected by the contracting firm. Karna Khatri of Devsayar and Kanchharam JV told Republica that they will complete concrete paving work by mid-November. But locals say that the contracting firm was trying to seek another extension to the deadline. The company had received first deadline extension in November last year. The contractor also paid penalty of Rs 1.4 million because of its failure to complete the project in time. As the project has not been completed within the second deadline, the contractor will have to pay penalty again. Some months ago, Khotang Chamber of Commerce and Industries had organized program to protest delay in bridge construction. It had even organized a sit in at the Department of Roads in the initiation of the district-based peace committee. 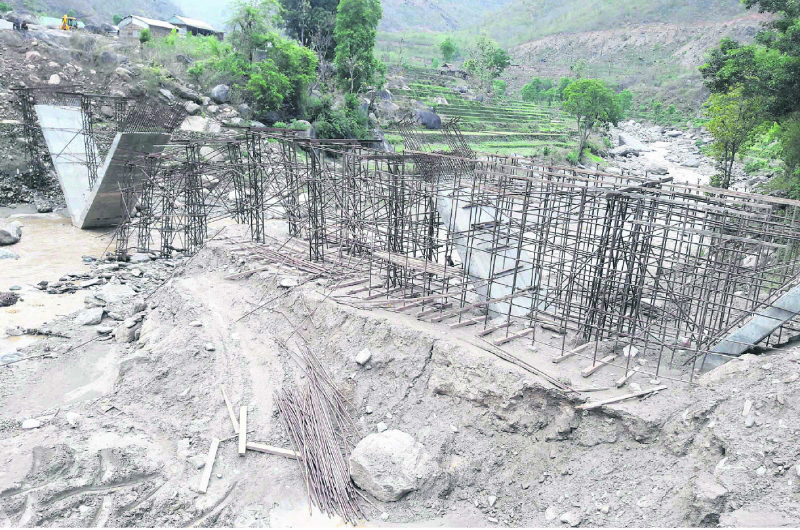 Construction of a bridge over Sunkoshi River in Phoksingtar of Khotang is moving ahead in a slow pace. Work pace suffered after design of the bridge was changed from suspension to arch. Lawmaker Bishal Bhattarai said that bridge construction work has remained rather slow. Gauri Parvati YP JV bagged the project worth Rs 196 million two years ago. “The contractor has only managed to dig foundation in the Udayapur side so far. It has also been damaged by floods,” Bhattarai added. Locals also told Republica that the contractor has only dig foundation to erect pillars. Construction had begun on April 5, 2013, targeting to complete the work by April 6, 2017. But the deadline was pushed back after the change in bridge design. Officials of the DoR said that the design of the bridge had to be changed from suspension to arch because of geographical difficulties of Phoksingtar.